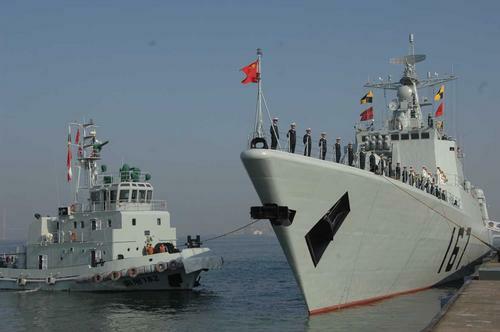 ZHANJIANG - A Chinese naval ship left here Wednesday morning for a port call to Japan, the first such visit in the history of the naval forces of the Chinese People's Liberation Army. The missile destroyer "Shenzhen" will visit Japan from November 28 to December 1, at the invitation of the Japanese Maritime Self-Defense Force. Rear Admiral Xiao Xinnian, vice chief of staff of the South China Sea Fleet of the People's Liberation Army (PLA) Navy, headed 345 naval officials and soldiers on the trip. The South China Sea Fleet held a warm seeing-off celebration at Zhanjiang, a port city in south China's Guangdong Province. During the four-day stay in Japan, Chinese naval officials and soldiers will conduct military exchange and entertainment activities with counterparts from the Japanese Maritime Self-Defense Force. The two sides will also visit each other's naval ships, and the two military bands will give joint performance for citizens in Tokyo. In addition, the "Shenzhen" will be open to the public. The "Shenzhen" is a modern missile destroyer, designed and made by China. It has visited 13 countries in Asia, Africa and Europe since its acceptance into service in 1999.